In the coming months the FiDA team will be conducting new research at the intersection of two broad themes: financial inclusion in the platform era and enterprises and financial inclusion. Apart from agriculture, Micro, Small, and Medium Enterprises (MSMEs), are the greatest source of employment in many countries in sub-Saharan Africa. They have have long been a focus of interest to the development community, but as digitization transforms the nature of work—from gig economies to international supply chains—the links between MSMEs and ICTs are increasingly important. We’ll be exploring how, in particular, the spread of ‘platforms’ (Google, Facebook, Alibaba, etc.) creates new models for (and avenues to) financial inclusion. As we get underway, we’d like to share the results of an exercise we conducted to help focus our research. Granted, it’s basically a 2×2, and as consultants we know these are common, but in this case we think it’s durable and useful to share. The first dimension in our table is the size of the firms in question. In our discussions, we found that the definition of MSME was quite broad; accordingly, we distinguish ‘Micro’ from ‘Small and Medium.’ However, there is no hard and fast rule for drawing this line. Some countries define microenterprises as firms with <10 employees, others draw the line at <5 employees. For sub-Saharan Africa, where firm sizes tend to be smaller (and the majority of firms are sole proprietorships) we think the <5 delineation makes more sense. By contrast, Small and Medium Enterprises(SMEs) are usually formal, registered, and paying taxes. These firms also face challenges vis-a-vis financial services, but they are not so much challenges of access as they are of suitability or affordability—loan terms might be too short, bank fees too high, etc. The second dimension refers to the nature of the enterprise as it relates to the digital economy. As Duncombe and Heeks have explained, there’s a key distinction between small firms that benefit from ICTs and small firms that produce ICTs. We see a durable conceptual split between ‘the broader economy,’ which is benefiting from and being transformed by digitization, and the subset of firms with ‘digital DNA’, which are making the products, delivering the services, and writing the code that underpins that digitization. A related but distinct category of firms are the platforms themselves—the handful of multinational superplatforms as well as a larger set of local and regional electronic marketplaces—that are transforming sectors of the economy in real time. This is what we mean by ‘the platform era’: platform logic has become central to the ways in which digitization and the internet are changing economies, and this platformization is a major theme for our work in the year ahead. Our typology is more clear if we place platforms in a different section of our framework. Box 1 involves the largest number of firms in any economy. Here we are dealing with the struggle of the everyday, how firms from small restaurants and fix-it shops to retail establishments might utilize national and global platforms in new ways. Research here would (and will!) explore how the traditional clients of microfinance institutions are adapting to the platform era. It could focus on the ways in which social media and the personal Internet is being appropriated to fit the needs of the smallest firms, even when the lines between entrepreneur and enterprise are blurred. Box 2 is quite different in that platforms may be providing new opportunities for small-scale economic organizations with ‘digital DNA’ to offer products and services in entirely new ways. The best, and perhaps most controversial, example of this might be gig work whereby individual proprietors or small firms utilize the infrastructures of labor platforms to earn livings in the cloud, mediated completely by the platform. Box 3 involves a country’s established, formal SME class. How do these firms adapt to the platform era? There are a host of innovations, from inventory and product management to advertising and financing, that can be offered at lower cost and higher value to these firms thanks to digitization. How, specifically, are the platforms involved with these new offerings? Box 4 involves digital startups; the stuff of businesses coming out of accelerator programs and preparing to take off. Many are businesses that write the software or design the new hardware that is customizing the global Internet and other digital technologies for African markets. There’s a great deal of enthusiasm around these businesses, but the research that one would do to understand a digital startup differs from the research one would do to understand the motorcycle repair shop just down the street. Both are enterprises, but they occupy very different places structurally, both in terms of their local economies and their international visibility. Box 5 is our floating adjunct to the 2×2, our acknowledgment that the platforms themselves deserve and require significant scrutiny. From Jumia to Sendy to WhatsApp for business, the terrain of platform-related digital services is shifting and expanding. Yet there is little work that specifically engages with the interface between platforms and all four of these MSME segments, particularly with respect to financial inclusion outcomes. Recent findings from FIBR, an R&D project of BFA in partnership with Mastercard Foundation, are beginning to fill this void, looking first at how Tanzanian merchants are moving online. Our next research project, kicking off in late 2018 in Kenya, will explore the connections between “box 1” microenterprises and the “box 5” platforms that serve them. All in all, there’s a lot of work to be done. 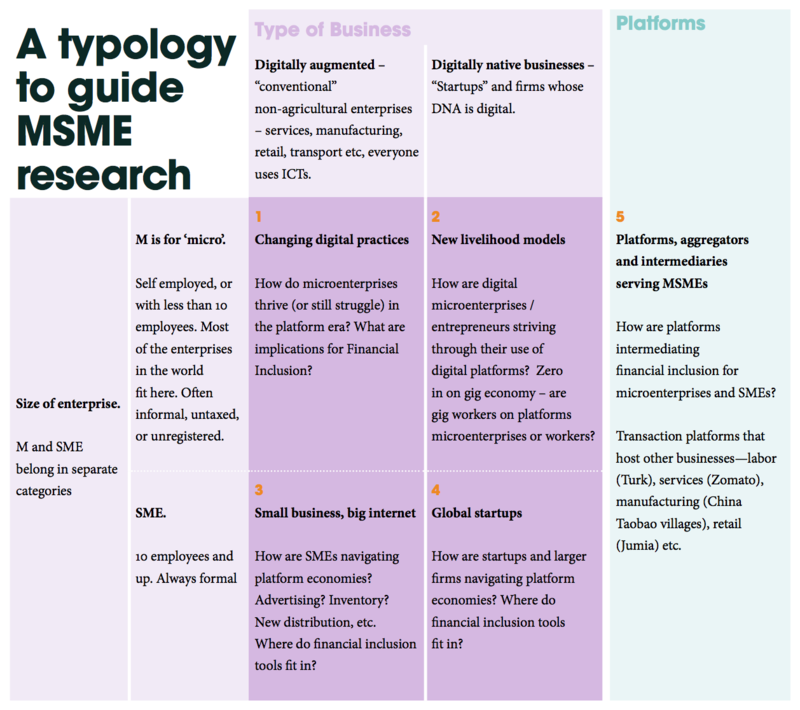 The point of this post is to sensitize readers to the importance of a bit of specificity regarding terms so that a generalized enthusiasm for platforms and/or MSMEs does not get in the way of refined research questions that can uncover new insights. We look forward to sharing updates about the research as it nears completion.